Not to be confused with Malays. This article is about the ethnic group. For the 2009 film, see Malayali (film). The Malayali people (also spelt Malayalee) are a multi ethnic linguistic group originating from the present-day state of Kerala in India. They are identified as native speakers of the Malayalam language, which is classified as part of the Dravidian family of languages. According to the Indian census of 2011, there are approximately 33 million Malayalis in Kerala, making up 96.7% of the total population of the state. Malayali minorities are also found in the neighboring state of Tamil Nadu, mainly in Kanyakumari district and also in other metropolitan areas of India. Over the course of the later half of the 20th century, significant Malayali communities have emerged in Persian Gulf countries, including the United Arab Emirates, Saudi Arabia, Oman, Qatar and Kuwait, and to a lesser extent, other developed nations with a primarily immigrant background such as the United States, United Kingdom, Australia, and Canada. As of 2013, there were an estimated 1.6 million ethnic Malayali expatriates worldwide. According to A. R. Raja Raja Varma, Malayalam was the name of the place, before it became the name of the language spoken by the people. Malayalam, the native language of Malayalis, has its origin from the words mala meaning mountain and alam meaning land or locality. Hence the term Malayali refers to the people from the mountains who lived beyond the Western Ghats, and Malayalam the language that was spoken there. The Skanda Purana mentions the ecclesiastical office of the Thachudaya Kaimal who is referred to as Manikkam Keralar (The Ruby King of Kerala), synonymous with the deity of the Koodalmanikyam temple. Hence the term Keralar seem to precede the usage of the word Malayala/Malayalam. According to the Indian census of 2001, there were 30,803,747 speakers of Malayalam in Kerala, making up 93.2% of the total number of Malayalam speakers in India, and 96.7% of the total population of the state. There were a further 701,673 (2.1% of the total number) in Karnataka, 557,705 (1.7%) in Tamil Nadu and 406,358 (1.2%) in Maharashtra. The number of Malayalam speakers in Lakshadweep is 51,100, which is only 0.15% of the total number, but is as much as about 84% of the population of Lakshadweep. In all, Malayalis made up 3.22% of the total Indian population in 2001. Of the total 33,066,392 Malayalam speakers in India in 2001, 33,015,420 spoke the standard dialects, 19,643 spoke the Yerava dialect and 31,329 spoke non-standard regional variations like Eranadan. As per the 1991 census data, 28.85% of all Malayalam speakers in India spoke a second language and 19.64% of the total knew three or more languages. Just before independence, Malaya attracted a large number of Malaylis. Large numbers of Malayalis have settled in Chennai (Madras), Delhi, Bangalore, Coimbatore, Hyderabad, Mumbai (Bombay) and Ahmedabad. A large number of Malayalis have also emigrated to the Middle East, the United States, and Europe. There were 644,097 people with Malayalam heritage in the United States, according to the 2012 census, with the highest concentrations in Bergen County, New Jersey and Rockland County, New York, including a large number of professionals. There were 7,093 Malayalam speakers in Australia in 2006. The 2001 Canadian census reported 7,070 people who listed Malayalam as their mother tongue, mostly in the Greater Toronto Area and Southern Ontario. In 2010, the Census of Population of Singapore reported that there were 26,348 Malayalees in Singapore. The 2006 New Zealand census reported 2,139 speakers. 134 Malayalam speaking households were reported in 1956 in Fiji. There is also a considerable Malayali population in the Persian Gulf regions, especially in Bahrain, Muscat, Doha, Dubai, Abu Dhabi, Kuwait and European region mainly in London. The Malayali live in an historic area known as the Malabar coast, which for thousands of years has been a major centre of the international spice trade, operating at least from the Roman era with Ptolemy documenting it on his map of the world in 150AD. For that reason, a highly distinct culture was created among the Malayali due to centuries of contact with foreign cultures through the spice trade. The arrival of the Cochin Jews, and the rise of Saint Thomas Christians in particular were very significant in shaping modern day Malayali culture. Later, Portuguese Latin Christians, Dutch Malabar, French Mahe, British English, and Arabian Muslim communities which arrived after 1498 left their mark as well making Kerala even more colourful, vibrant, and diverse. Malayalis can now be seen in all the countries of the world with the excellence of adaptation to any culture, food habits, language. In 2017, a detailed study of the evolution of the Singapore Malayalee community over a period of more than 100 years was published as a book: From Kerala to Singapore: Voices of the Singapore Malayalee Community. It is believed to be the first in-depth study of the presence of a NRI Malayalee community outside of Kerala. Malayalam is the language spoken by the Malayalis. Malayalam is derived from old Tamil in the 6th century. For cultural purposes Malayalam and Sanskrit formed a language known as Manipravalam, where both languages were used in an alternating style. Malayalam is the only language among the major Dravidian languages without diglossia. This means, that the Malayalam which is spoken does not differ from the written variant. Malayalam is written using the Malayalam script. Malayalam literature is ancient in origin. The oldest literature works in Malayalam, distinct from the Tamil tradition, is dated between the 9th century and 11th century. Malayalam literature includes the 14th century Niranam poets (Madhava Panikkar, Sankara Panikkar and Rama Panikkar), whose works mark the dawn of both modern Malayalam language and indigenous Keralite poetry. The Triumvirate of poets (Kavithrayam: Kumaran Asan, Vallathol Narayana Menon and Ulloor S. Parameswara Iyer) are recognized for moving Keralite poetry away from archaic sophistry and metaphysics and towards a more lyrical mode. In 19th century Chavara Kuriakose Elias, the founder of Carmelites of Mary Immaculate and Congregation of Mother of Carmel congregations, contribute different streams in the Malayalam Literature. All his works are written between 1829 and 1870. Chavara's contribution  to Malayalam literature includes, Chronicles, Poems – athmanuthapam (compunction of the soul), Maranaveettil Paduvanulla Pana (Poem to sing in the bereaved house) and Anasthasiayude Rakthasakshyam – and other Literary works . In the second half of the 20th century, Jnanpith awardees like G. Sankara Kurup, S. K. Pottekkatt, Thakazhi Sivasankara Pillai and M. T. Vasudevan Nair and non Jnanpith awardees like Vaikom Muhammad Basheer have made valuable contributions to the Malayalam literature. Later, such Keralite writers as O. V. Vijayan, Kamaladas, Kakkanadan, Sugathakumari, M. Mukundan, and Booker Prize winner Arundhati Roy, whose 1996 semi-autobiographical bestseller The God of Small Things is set in the Kottayam town of Ayemenem, have gained international recognition. Kerala remains a fascinating riddle for the Indian diaspora, especially the younger generations - World Malayali Council with its sister organisation, International Institute for Scientific and Academic Collaboration (IISAC) has come out with a comprehensive book on Kerala titled ‘Introduction to Kerala Studies,’ specially intended for the Malayali diaspora across the globe. J.V. Vilanilam, former Vice-Chancellor of the University of Kerala; Sunny Luke, medical scientist and former professor of Medical Biotechnology at Adelphi University, New York; and Antony Palackal, professor of Sociology at the Loyola College of Social Sciences in Thiruvananthapuram, have edited the book, besides making other contributions to it. Tharavadu is a system of joint family practised by Malayalis, especially castes Namboothiris, Ambalavasis, Nairs, Ezhava, Thiyyas and other prominent ethnoreligious groups. Each Tharavadu has a unique name. The Tharavadu was administered by the Karanavar, the oldest male member of the family. He would be the eldest maternal uncle of the family as well. The members of the Tharavadu consisted of mother, daughters, sons, sisters and brothers. The fathers and husbands had very minimal role to play in the affairs of the Tharavadu. It was a true matrilineal affair. The Karanavar took all major decisions. He was usually autocratic. However, the consent of the eldest female member of the family was taken before implementing the decisions. This eldest female member would be his maternal grandmother, own mother, mother's sister, his own sister or a sister through his maternal lineage. Since the lineage was through the female members, the birth of a daughter was always welcomed. Each Tharavadu also has a Para Devatha (clan deity) revered by those in the particular Tharavadu. Temples were built to honor these deities. Kerala's society is less patriarchical than the rest of India. Certain Hindu communities such as the Nairs, some Ezhava families in Travancore and Cochin, Thiyyas in north Kerala and Muslims around Kannur, Varkala and Edava in Thiruvananthapuram used to follow a traditional matrilineal system known as marumakkathayam which has in the recent years (post Indian independence) ceased to exist. Christians, Muslims, and some Hindu castes such as the Namboothiris and some Ezhavas follow makkathayam, a patrilineal system. Kerala's gender relations are among the most equitable in India and the Majority World. Kerala, the native land of Malayalis has a tropical climate with excessive rains and intensive solar radiation. The architecture of this region has evolved to meet these climatic conditions by having the form of buildings with low walls, sloping roof and projecting caves. The setting of the building in the open garden plot was again necessitated by the requirement of wind for giving comfort in the humid climate. Timber is the prime structural material abundantly available in many varieties in Kerala. Perhaps the skilful choice of timber, accurate joinery, artful assembly and delicate carving of wood work for columns, walls and roofs frames are the unique characteristics of Malayali architecture. From the limitations of the materials, a mixed mode of construction was evolved in Malayali architecture. The stone work was restricted to the plinth even in important buildings such as temples. Laterite was used for walls. The roof structure in timber was covered with palm leaf thatching for most buildings and rarely with tiles for palaces or temples. The Kerala murals are paintings with vegetable dyes on wet walls in subdued shades of brown. The indigenous adoption of the available raw materials and their transformation as enduring media for architectural expression thus became the dominant feature of the Malayali style of architecture. Nalukettu was a housing style in Kerala. Nalukettu is a quadrangular building constructed after following the Tachu Sastra (Science of Carpentry). It was a typical house which was flanked by out-houses and utility structures. The large house-Nalukettu is constructed within a large compound. It was called Nalukettu because it consisted of four wings around a central courtyard called Nadumuttom. The house has a quadrangle in the center. The quadrangle is in every way the center of life in the house and very useful for the performance of rituals. The layout of these homes was simple, and catered to the dwelling of a large number of people, usually part of a tharavadu. Ettukettu (eight halled with two central courtyards) or Pathinarukettu (sixteen halled with four central courtyards) are the more elaborate forms of the same architecture. 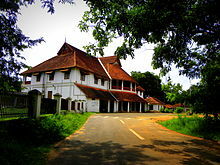 An example of a Nalukettu structure is Mattancherry Palace. Malayalis use two words to denote dance, which is attom and thullal. The art forms of Malayalis are classified into three types. They are (i)Religious like Theyyam, Bhagavatipattu etc., (ii)Semi religious like Sanghakali, Krishnanattom etc., and (iii)Secular like Kathakali, Mohiniyattam, Thullal etc. Kathakali and Mohiniyattam are the two classical dance forms from Kerala. Kathakali is actually a dance-drama. Mohiniyattam is a very sensual and graceful dance form that is performed both solo and in a group by women. Kutiyattam is a traditional performing art form from Kerala, which is recognised by UNESCO and given the status Masterpieces of Oral and Intangible Heritage of Humanity. Ottamthullal is another performing art, which is also known as the poor man's Kathakali, which was created by the poet Kunchan Nambiar as an alternative to Chakiarkooth (another performing art), which was open only for higher castes to see. Theyyam is a ritualistic art form of Malayalis, which is thought to predate hinduism and to have developed from folk dances performed in conjunction with harvest celebrations. Theyyam is performed as an offering to gods so as to get rid of poverty and illness. Velakali is another ritualistic art form, mainly performed at temples in the festival time. Kolkali is a folk art in which dance performers move in a circle, striking small sticks and keeping rhythm with special steps. Many ancient Malayali family houses in Kerala have special snake shrines called Kavu. Sarpam Thullal is usually performed in the courtyard of houses having snake shrines. This is a votive offering for family wealth and happiness.Kerala Natanam ( കേരള നടനം ) (Kerala Dance) is a new style of dance that is now recognised as a distinct classical art form evolved from Kathakali. The Indian dancer Guru Gopinath ( ഗുരു ഗോപിനാഥ്‌ ) a well-trained Kathakali artist and his wife Thankamani Gopinath developed this unique form of dance. Performing arts in Kerala is not limited to a single religion of the Malayali society. Muslim Mappilas, Nasranis and Latin Christians have their own unique performing art forms. Duff Muttu, also known as Dubh Muttu/Aravanamuttu is a performing art form prevalent among the Muslim community. It is a group performance, staged as a social event during festivals and nuptial ceremonies. Oppana is a popular form of social entertainment among the Muslim community. It is a form accompanied by clapping of hands, in which both men and women participate. Margamkali is a performing art which is popular among the Saint Thomas Christians. It combines both devotion and entertainment, and was performed by men in groups. Since 1980's women also have found groups. The dancers themselves sing the margamkali songs in unison call and response form.Parichamuttukali is another performing art which is popular among Saint Thomas Christians. This is an artistic adaptation of the martial art of Kerala, Kalaripayattu. Chavittu nadakom is a theatrical art form observed mainly by Kerala Latin Christians, dating back to the second half of the 16th century. However, many of these native art forms largely play to tourists or at youth festivals, and are not as popular among ordinary Keralites. Thus, more contemporary forms – including those heavily based on the use of often risqué and politically incorrect mimicry and parody – have gained considerable mass appeal in recent years. Indeed, contemporary artists often use such modes to mock socioeconomic elites. Since 1930 when the first Malayalam film Vigathakumaran was released and over the following decade or two, Malayalam cinema had grown to become one of the popular means of expression for both works of fiction and social issues, and it remains so. Music formed a major part of early Malayalam literature, which is believed to have started developing by 9th century CE. The significance of music in the culture of Kerala can be established just by the fact that in Malayalam language, musical poetry was developed long before prose. Kerala is musically known for Sopanam. Sopanam is religious in nature, and developed through singing invocatory songs at the Kalam of Kali, and later inside temples. Sopanam came to prominence in the wake of the increasing popularity of Jayadeva's Gita Govinda or Ashtapadis. Sopana sangeetham (music), as the very name suggests, is sung by the side of the holy steps (sopanam) leading to the sanctum sanctorum of a shrine. It is sung, typically employing plain notes, to the accompaniment of the small, hourglass-shaped ethnic drum called idakka, besides the chengila or the handy metallic gong to sound the beats. Sopanam is traditionally sung by men of the Marar and Pothuval community, who are Ambalavasi (semi-Brahmin) castes engaged to do it as their hereditary profession. Kerala is also home of Carnatic music. Legends like Swati Tirunal, Shadkala Govinda Maarar, Sangitha Vidwan Gopala Pillai Bhagavathar, Chertala Gopalan Nair, M. D. Ramanathan, T.V.Gopalakrishnan, M.S. Gopalakrishnan, L. Subramaniam T.N. Krishnan & K. J. Yesudas are Malayali musicians. Also among the younger generations with wide acclaim and promise is Child Prodigy Violinist L. Athira Krishna etc., who are looked upon as maestros of tomorrow. Kerala also has a significant presence of Hindustani music as well. The king of Travancore, Swathi Thirunal patronaged and contributed much to the Hindustani Music. The pulluvar of Kerala are closely connected to the serpent worship. One group among these people consider the snake gods as their presiding deity and perform certain sacrifices and sing songs. This is called Pulluvan Pattu. The song conducted by the pulluvar in serpent temples and snake groves is called Sarppapaattu, Naagam Paattu, Sarpam Thullal, Sarppolsavam, Paambum Thullal or Paambum Kalam. Mappila Paattukal or Mappila Songs are folklore Muslim devotional songs in the Malayalam language. Mappila songs are composed in colloquial Malayalam and are sung in a distinctive tune. They are composed in a mixture of Malayalam and Arabic. Film music, which refers to playback singing in the context of Indian music, forms the most important canon of popular music in India. Film music of Kerala in particular is the most popular form of music in the state. Vallam Kali, is the race of country made boats. It is mainly conducted during the season of the harvest festival Onam in Autumn. Vallam Kali include races of many kinds of traditional boats of Kerala. The race of Chundan Vallam (snake boat) is the major item. Hence Vallam Kali is also known in English as Snake Boat Race and a major tourist attraction. Other types of boats which do participate in various events in the race are Churulan Vallam, Iruttukuthy Vallam, Odi Vallam, Veppu Vallam (Vaipu Vallam), Vadakkanody Vallam, and Kochu Vallam. Nehru Trophy Boat Race is one the famous Vallam Kali held in Punnamada Lake in Alappuzha district of Kerala. Champakulam Moolam Boat Race is the oldest and most popular Vallam Kali in Kerala. The race is held on river Pamba on the moolam day (according to the Malayalam Era) of the Malayalam month Midhunam, the day of the installation of the deity at the Ambalappuzha Sree Krishna Temple. The Aranmula Boat Race takes place at Aranmula, near a temple dedicated to Lord Krishna and Arjuna. The President's Trophy Boat Race is a popular event conducted in Ashtamudi Lake in Kollam. Thousands of people gather on the banks of the river Pamba to watch the snake boat races. Nearly 50 snake boats or chundan vallams participate in the festival. Payippad Jalotsavam is a three-day water festival. It is conducted in Payippad Lake which is 35 km from Alappuzha district of Kerala state. There is a close relation between this Payippad boat race and Subramanya Swamy Temple in Haripad. Indira Gandhi Boat Race is a boat race festival celebrated in the last week of December in the backwaters of Kochi, a city in Kerala. This boat race is one of the most popular Vallam Kali in Kerala. This festival is conducted to promote Kerala tourism. Malayalis celebrate a variety of festivals, namely Onam, Christmas, Vishu (Malayalam New Year), Easter, Deepavali, Ramadan and Bakrid. Malayali cuisine is not homogeneous and regional variations are visible throughout. Spices form an important ingredient in almost all curries. Kerala is known for its traditional sadhyas, a vegetarian meal served with boiled rice and a host of side-dishes. The sadhya is complemented by payasam, a sweet milk dessert native to Kerala. The sadhya is, as per custom, served on a banana leaf. Traditional dishes include sambar, aviyal, kaalan, theeyal, thoran, injipully, pulisherry, appam, kappa (tapioca), puttu (steamed rice powder), and puzhukku. Coconut is an essential ingredient in most of the food items and is liberally used. Puttu is a culinary specialty in Kerala. It is a steamed rice cake which is a favourite breakfast of most Malayalis. It is served with either brown chickpeas cooked in a spicy gravy, papadams and boiled small green lentils, or tiny ripe yellow Kerala plantains. In the highlands there is also a variety of puttu served with paani (the boiled-down syrup from sweet palm toddy) and sweet boiled bananas. to steam the puttu, there is a special utensil called "Puttu Kutti". It consists of two sections. The lower bulkier portion is where the water for steaming is stored. The upper detachable leaner portion is separated from lower portion by perforated lids so as to allow the steam to pass through and bake the rice powder. Appam is a pancake made of fermented batter. The batter is made of rice flour and fermented using either yeast or toddy, the local spirit. It is fried using a special frying pan called appa-chatti and is served with egg curry, chicken curry, mutton stew, vegetable curry and chick pea curry. Malayalis have their own form of martial arts called Kalaripayattu. This type of martial arts was used as defensive mechanism against intruders. In ancient times, disputes between nobles (naaduvazhis or Vazhunors) were also settled by the outcome of a Kalaripayattu tournament. This ancient martial art is claimed as the mother of all martial arts. The word "kalari" can be traced to ancient Sangam literature. Anthropologists estimate that Kalarippayattu dates back to at least the 12th century CE. The historian Elamkulam Kunjan Pillai attributes the birth of Kalaripayattu to an extended period of warfare between the Cheras and the Cholas in the 11th century CE. What eventually crystallized into this style is thought to have been a product of existing South Indian styles of combat, combined with techniques brought by other cultures. Kalaripayattu may be one of the oldest martial arts in existence. The oldest western reference to Kalaripayattu is a 16th-century travelogue of Duarte Barbosa, a Portuguese explorer. The Southern style, which stresses importance of hand-to-hand combat is slightly different than Kalari in the north. ^ Mikael Parkvall, "Världens 100 största språk 2007" (The World's 100 Largest Languages in 2007), in Nationalencyklopedin. Asterisks mark the 2010 estimates for the top dozen languages. ^ "Census of India". Archived from [the original Check |url= value (help) (PDF) on 13 May 2010. Retrieved 7 January 2008. ^ a b "Kerala Migration Survey - 2014". The Indian Express. ( This is the number of approximate emigrants from Kerala, which is closely related to, but different from the actual number of Malayalis.) (17 September 2014). Retrieved 21 October 2014. ^ a b c d Zachariah, K. C. & Rajan, S. Irudaya (2011), Kerala Migration Survey 2011 (PDF), Department of Non-resident Keralite Affairs, Government of Kerala, p. 29. This is the number of emigrants from Kerala, which is closely related to but different from the actual number of Malayalis. ^ "India-born Malayalam-speaking community in Australia: Some interesting trends". Times of India (16 July 2014). Retrieved 21 October 2014. ^ "Where Malayalees once held sway". DNA India. 5 October 2005. Retrieved 11 August 2015. ^ a b c d "Population by religious community - 2011". 2011 Census of India. Office of the Registrar General & Census Commissioner. Archived from the original on 25 August 2015. Retrieved 25 August 2015. ^ 재외동포현황 총계(2015)/Total number of overseas Koreans (2015). South Korea: Ministry of Foreign Affairs and Trade. 2015. Retrieved 30 March 2014. ^ Varma, A.R. Rajaraja (2005). Keralapanineeyam. Kottayam: D C Books. ISBN 81-7130-672-1. ^ See Sahyadri Kanda Chapter 7 in Skanda Purana. Rocher, Ludo (1986). The Puranas. Otto Harrassowitz Verlag. ISBN 978-3447025225. ^ Pillai, Anitha Devi. From Kerala to Singapore : Voices from the Singapore Malayalee community. Puva Arumugam,. Singapore: Marshall Cavendish Pte Ltd. ISBN 9789814721837. OCLC 962741080. ^ Pillai, Anitha Devi (2017). From Kerala to Singapore : voices from the Singapore Malayalee community. Puva Arumugam,. Singapore: Marshall Cavendish. ISBN 9789814721837. OCLC 962741080. ^ Malayalam, R. E. Asher, T. C. Kumari, Routledge, ISBN 0-415-02242-8, 1997. page 24. ^ "Trios of modern Malayalam literature". ^ Cooper KJ (20 October 1997). "For India, No Small Thing; Native Daughter Arundhati Roy Wins Coveted Booker Prize". Washington Post. Retrieved 28 December 2008. ^ Lyall, Sarah (15 October 1997). "Indian's First Novel Wins Booker Prize in Britain". New York Times. Retrieved 11 November 2007. ^ "Winds, Rivers & Rain". Salon. September 1997. Retrieved 11 November 2007. ^ Lindberg 2004, pp. 18–19. ^ Government of Kerala 2002b. ^ Government of Kerala 2004r, p. 366. ^ Lindberg 2004, p. 1. ^ a b c d e f "Kerala architecture". ^ a b "Kerala dance forms". ^ a b "Classical dance forms of India". ^ a b c d "Christian art foms". ^ Sreedhara Menon, A. Kerala Charithram. Kottayam, Kerala: D.C. Books. p. 494. ^ Rolf, Killius (2006). Ritual Music and Hindu Rituals of Kerala. New Delhi: BR Rhythms. ISBN 81-88827-07-X. ^ a b "Music". Keral.com. Archived from the original on 2 August 2008. Retrieved 2 January 2009. ^ a b c Zarrilli, Phillip B. A South Indian Martial Art and the Yoga and Ayurvedic Paradigms. University of Wisconsin–Madison.